Made from flexible, plastic mesh to allow air circulation, Shoofly Leggins are easy to attach, comfortable to wear, and will not sag due to their unique sewn-in plastic stays. And they're patented! LOVE LOVE LOVE them.....so do the horses. They look a bit weird (like upside down bell bottoms) but work great and are super cost-effective since you get a pack of four. They are a life-saver for my horse. My mare pulled off other brands but she is fine with this style. Best thing for leg fly control ever. I leave on 24/7 during fly season. I have one creative horse who occasionally will remove one, but overall the horses leave alone. I actually got blue smalls. My mare would normally wear medium, but I decided to get smalls after reading other reviews. Glad I did because they fit and do not come off. I do not have to worry about fly bites on her legs any more. They do their job. Great product!! Bought a new medium set to be ready for the spring. My horse wears them proudly! I love these fly boots! I got one pair to put on both my horse's front legs. I've struggled with chipped feet due to stomping for years and finally decided to get the Shoo Flys… absolutely love them. No chips!! It worked as advertised and horse seemed to like the leggins. No problems. I wish I would of bought these along time ago! These work great out in the pasture. I have purchased fleece lined leggings and am always picking off itchy things that cling to them. The orange color makes them easy to find if they do get pulled off in the field. I just hose them off when they need freshened up. These do what they're supposed to do. Seem to keep flies off their legs. They have had one or two come off, but what's nice about the orange color is you can spot it pretty easily in the pasture. Easy on and off. Doesnt interfere with gaits doesnt seem to cause rubs.. I love my shoo fly boots for my horses. They stay up and on, fantastic! So far so good. They seem very durable. My thorough bred kicked them off of her back legs the first day, so I have to find a way to tighten them. But they really seem to work to defeat flies. I plan to order another set. I love my new Shoofly leggings! So does my horse! They stay up, closed and on her legs 24/7. They are wonderful! I think we should make some that are taller. This is 7th set of boots I’ve purchased. I leave them on 24/7, except on long rides, during fly season. If you have a horse with smaller feet definitely order the small size or they will walk out of them. They help minimize fly stomping and have held up well for me. Size small fit my 2 large ponies perfect (they wear 66" sheets). No more stomping feet. Good quality mesh & velcro should last several years. These are fabulous. I even leave them on when riding. So much less stomping and fretting over the flies! I do really like the shoofly boots and believe they work well. Went with the orange, so they are easy to find if they would happen to fall off. The Shoo Fly leggings work great!! Dennis the Menace type horses don't try to get them off, I guess because he knows how much they help!!! They are easy to put on and off daily, and work great for flies and seem to work for gnats too. I think they should be a little smaller around the leg - run big. And there should be more black fleece instead of white at the bottom. 3 stars. While I really like that they are stiff & much harder to get kicked off & believe me when I say they tried, there are some negative points: 1). The bell shape makes them a trap for catching poop, 3 out of my 4 horses had this problem which made them more fly attractants 2) They run big, using the proposed sizing chart for my qtrs, they were too loose & kicked them loose. I am stitching tucks in both the top & bottom of them for my Qtrs so the Velcro meshes & there's limited belling to preclude the poop issue. For my Appy I'm only stitching tucks in the top as his hoof is larger so the bottom actually fits his foot. 3) Having a white fleece band shows how filthy they get especially after s month with little to no rsin. The white is pert near impossible to clean. So I give them a 3?? These do work well. I ordered and received a medium. This was for a 1150 lb horse. The medium fit well. A large would have been too big. Saves the hooves a ton, no stomping. Love these! I actually bought he blue because I don't like orange but the one time it fell off my horse I couldn't find it, highly reccomend ordering the orange, my next set will be that's for sure! Great product - have kept my horse's hooves from chipping due to stomping. They also stay on and he is free to graze, roll, etc. without them coming off or shifting. I highly recommend this product. I really wanted to love these fly socks, however, they fill up with manure which attracts more flys. The mini size were the only ones that did not fill up with manure. So far they are holding up OK, however I think they will start to show lots of wear, as I have to take them off multiple times a day to dump the manure out. I was introduced to these boots by another boarder at my barn and they may look funny but who cares. I have blue, grey colors and I have about 4 pairs of them to rotate. These are a must have for my big guy. These are s good fly boot and the design is great. Construction seems to be good. Horse.com has the best price! I purchased for a 23 y/o thoroughbred. His legs were scabby and he developed rain rot. I put the leggins on and within days his legs were healed. It was amazing! He's put on weight and is much happier after just a few weeks. The only issue is some rubbing on one pastern. I ordered a set of the large and the set of the medium. They both run large. The medium was too big even for my 1500lb gelding that wears a size 3 shoe and has real good bone. The design with the top being larger, allows for flies to get down into the boot and cause more irritation than not wearing them at all due to the flies being stuck inside the boot. I am returning these back to Horse.com due to this. After initial awkwardness my horses adapted to them quickly and the stomping has been reduced to almost nothing. Dont know how long they will last but well worth the money. Most important, they stay up on the leg and stay on. I would like it if the fit were more adjustable becsuse my OTTB has skinny legs but the looseness doesn't seem to bother him. And if they do come off the bright orange color makes it easy to find! They keep the flies from biting his ankles so he is stomping less. Remains to be seen how long they will last. This is my second purchase of Shoo Fly Leggins for my horse. The last pair lasted for two years. It is amazing how well these work keeping my horse from being miserable from flies on his lower legs. He rarely stomps his feet when out grazing. They also keep the air circulating and his legs cool unlike other fly boots that are very hot. I only gave them a four for durability as the trim got worn at the bottom edges. I believe that if the barn helpers would of put these on correctly that they would of lasted for more years. They have a tendency to hurry and not adhere them properly. I bought blue this time so I could see them in the field if he stepped out of them due to poor placement. When placed correctly, they never came off. My only suggestion would be to make the trim black so it would not get as dirty as the white trim. These wash and dry very easily. I can't think of going a summer without these on my horse. He is so much happier with them on. Glad I took a chance and tried them. Better than any other boot out there! I absolutely LOVE Shoofly Leggin's. My mare wore them all season last year, and never developed any rubs. She figured out that they kept the flies off her legs, and quickly stood still to allow me to put them on. I have a friend whose horse spooked a little the first time they were put on - so it may take a little desensitization for some. They hold up pretty well - even during turn out with other horses. My girl only had one come off a couple times. They can be worn safely 24/7. Even though they're open at the top (which is great for horse comfort), flies don't go into them. My farrier also loves how they keep her from stomping. They're awesome and well worth the purchase! I first saw these fly boots oat a barrel race; a fellow competitor had them on her horses. I asked her about them and she told me what they are called and how well they work. I really like how they are sold in sets of 4. They came in the mail quickly. My horses no longer stomp when turned out. Highly recommend! A friend has used the Leggins for approx. three years, she recommended them when I inquired. I thought Id give them a try flys are terribl year. Gotta try 'em! Other horses are using them and have no split hooves from stomping. Just purchased two sets and I cannot believe my horses do not stomp at all. Highly recommend! These funny things really work! No rubs and the horses get used to them quickly. No more stomping. Good product stays in place doesn't sag. Has anyone had a problem with their horse chewing/pulling off these boots? My horse is mouthy and I don't want to waste the money if it will just be a toy for him! BEST ANSWER: A horse who likes to chew his own or other horses' leg wraps will unfortunately be able to remove any brand. I have not personally had any issue with him chewing them off or another horse trying to remove them. Cayenne with Vaseline should do the trick. My Quarter horse is 15.1 hands tall. Would he need a medium or large shoofly legging? Thanks! Medium, Recommended for a 15 hand horse, average horse, quarter horse. Length 14.5 in. Bottom Circumference 14.5 in. Top Circumference 18.5 in. Large, Recommended for a 16 hand horse or draft size. Length 15 in. Bottom Circumference 15 in. Top Circumference 19.5 in. The medium is recommended for a 15 hand average sized horse like a Quarter Horse. My horse is 16.1 and wears a large. I hope that they work as well for your horse as for mine. No more stomping or hot legs in other fly boots. Hope this helped. 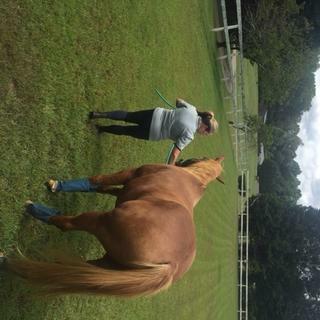 My QH is 15.3 and I bought both sizes and the small has worked out the best., The medium tends to slide off his leg in the field and sometimes gets caught in his shoe. My horse is about the same size. I ordered the medium and they fit fine. Love these boots and I am planning ordering a second pair. My horses are 15.2 and I ordered the mediums....they fit and work great! You can always measure. My 16.2 warm blood wears a large. I think a medium would be the right size for your 15.1 horse. Medium will do. My Quarter is 15.2 and they fit fine. Are they open at the top? Does anyone find that flies, burrs, etc. get in they the top? They are open at the top and fit quite loosely around the top. I have not had a problem that flies or burs getting inside, but occasionally some manure falls into the hind boots. They are very easy to clean either in the laundry or with a hose. These are the most effective fly boots I've used because the stiffeners prevent them from falling down.. Yes they are open at the top, but I have not seen any flies within the boots. I don't have mine in pasture, so I don't know if burrs, etc.could get inside, however I can see that if they were walking through bushes then maybe things might fall in. I absolutely love them and they will be the only fly boots I will buy. They are open at top, i only found some manure in one once when my mare first started wearing them. It must of been a lucky shot cause i haven't found anything stuck in them since. I can also honestly say that she stomps easily 10 times less often than the horses who are not wearing these. They are open at the top. I can't say why but flies do not go in there! I don't have burrs but doubt that they would find their way in. I believe the reason they work so well is because they are open and are not fitted to the leg. I have used these for many years. My horse was protected from the flies and other annoying insects. It stopped him from stamping. He also wasn't uncomfortable wearing them. The one drawback is that they only lasted one season. They are open, lots of air flow & the flies won't go down in the boots. I've used them for two years with no problems with anything going in the top. They worked great! They are open at the top, and they fill up with manure. How many are there for that price 2 or 4? BEST ANSWER: The price is for a set of 4, all exactly alike. I use them on just the front legs of my pony, so that leaves me with a spare set for future use. There are four per package. We have three horses using them and we love them! I received 4 when I ordered. These are a pack of 4. It's a pack of 4!! What is best way to wash these? BEST ANSWER: I wash mine with ivory soap and an old grooming brush. I rinse them really good and let air dry. I have three sets and rotate them. I have just used a hose and stiff brush to wash them. The material lets the gunk go pretty easy. If my 2 mares bottom circumferences are 13.5 and 13.75. Does that mean the small would be best for them? BEST ANSWER: If the other measurements line up as well, then probably the small would be the first size to try. I think that would work. I got large for my 16 hand mule and they fit true to size, they adjust some at the top and bottom with the Velcro closures so you can adjust. They work great! I would recommend the small to be safe. The medium will be way to big and they will slide of and get caught in there shoes if they have any on. what size will fit a yearling of average bone? I have been using size small on my 6 year old mare, 13 hands. Haven't came off yet and she is very active. I measured my horses legs and the leggings fit exactly what the size chart matched. What size??? I have a small, short horse 14hds. with a pony shaped body but small Refined horse style legs,(short and thin legs and a small hoof). Is the Small size of shoofly leggings going to be too big? Everything i get for a small,cob,or Arab size is always still just a little too big for her. I wouldn't rely on the recommendations for size. I have at 15.3 horse and I bought both the small and medium. The small work better on him as the medium would come off him in the field. From my personal experience the small size would be too large, mini size too small. Would there be any protection from the sun with these boots? Looking for fly protection along with sun screen for white stockings that burn during daytime turnout. BEST ANSWER: Not sure about the sun protect but my horse has white stocking and he has been fine for the last two summers wearing them. They would provide a little sun protection by physically covering the legs, yes. Are four boots in one order or two boots? I need four. BEST ANSWER: These shoo fly leggings are a set of four, information is also listed in items product summary. What size shoo fly boots for quarter horse? BEST ANSWER: Measure horse from cannon bone to bottom of ankle and compare sizes with chart. What size for Sr . Arab mare ? The length of the horses leg.